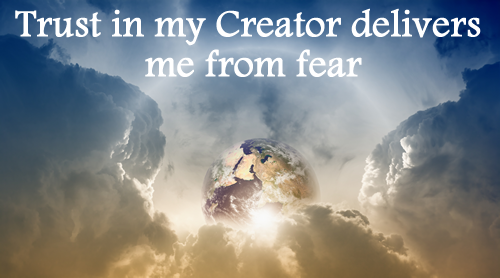 Trust in my Creator delivers me from fear. I have no reason to live fearfully. I am learning to trust in order to rid myself from all anxiety. I rest safely in the arms of my Creator, knowing that I am an important piece of a much bigger picture. Fear flees from my thoughts the minute I acknowledge that I am not alone. I can rely on the strength and wisdom of my Creator to guide me through the journey of life. I find peace when I take the pressure off of myself and embrace the Creator’s help. I give my best to everything I do. Each day, I seek to become a better person than I was the day before. But there comes a point where my natural strength ends and my faith begins. When I actuate my faith, I eradicate fear from my life. Faith requires that I give up control. The birthplace of worry is a heart full of pride. My heart is humble enough to accept that I need help. Taking the spotlight off of myself gives me great freedom. Peace of mind comes from knowing I do not have to have all the answers. In the journey of life, I simply need to follow my heart and allow the Author of life to write the story. Today, I choose to accept my Creator’s hand stretched out before me. I terminate apprehension by joining forces with my Creator, instead of looking within myself for all the answers. How is humility an integral part of faith? What burdens do I need to release today? Does my current situation require more than just my natural strength?